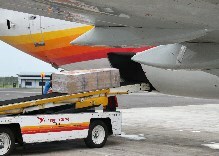 Surinam Airways cargo offers reliable transportation of general cargo to and from all its destinations and beyond with other carriers or via trucking companies. Cargo that is not specified as special cargo can be sent as general cargo. For info about prices and conditions, please contact the nearest Surinam Airways office or your authorized agent or go online.